1. Washed and soaked all 3 types of rice submerge in water for at least 5 hours, I did mine overnight. 2. Drained well, place the rice in blender with 200 ml of drinking water, grind until smooth. Take out 30 g of batter and place in a bowl. 3. Bring 80 ml of water to rolling boil, pour it into the 30 g of batter that we set aside just now to make Roux. 4. Add 2 tbsp of shallot oil ,1/2 tsp of salt and the remaining 220 ml of water into the batter, mix well. 5. Combine Roux with batter and whisk together to form a mixture of the consistency of heavy cream, let it sit for 10 minutes before steaming. 6. Bring water in a steamer to boil. Brush a layer of shallot oil/cooking oil over an 8 inches baking tray. 7. Ladle 1/3 cup (1/4 cup if you like it thinner) of batter/mixture into the tray and tilt around to create even coating on the bottom. The rice sheet should be very thin, roughly around 2 mm in thickness. 8. 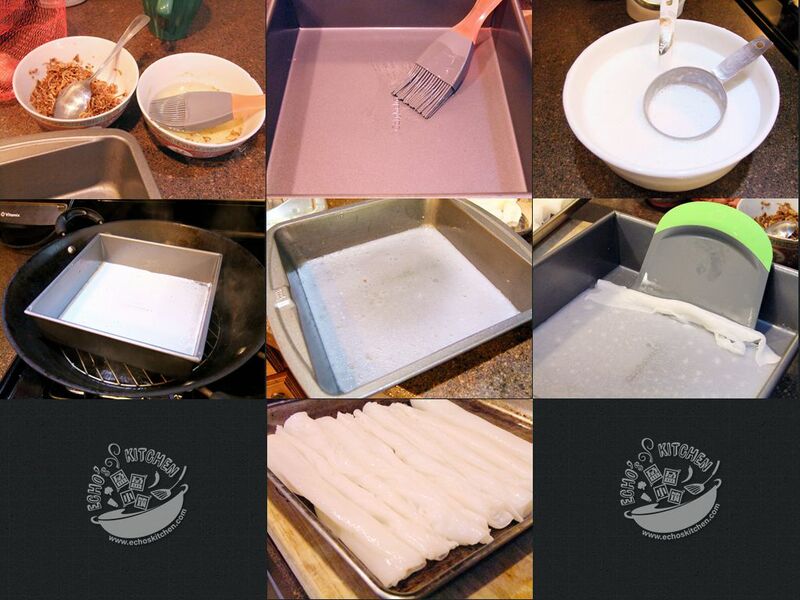 Steam the sheet for 2-2.5 minutes at high until large air bubbles form from underneath the sheet. 9. Take the tray out and let cool for a minute, use a scraper to scrape from top to bottom to help roll the sheet into a roll. Place it onto a tray that is brushed with a layer of oil/shallot oil. 10. Repeat the same process for remaining batter. Use two trays to speed up the process. 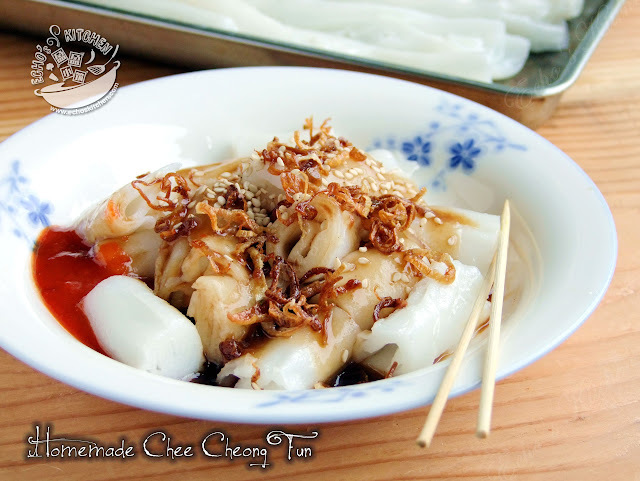 Note：Try serving the cheong fun 1-2 hours after steaming, it taste better and is crunchier in texture. Let cool before serving, serve with Fried shallot, roasted sesame, sweet sauce/chili sauce. 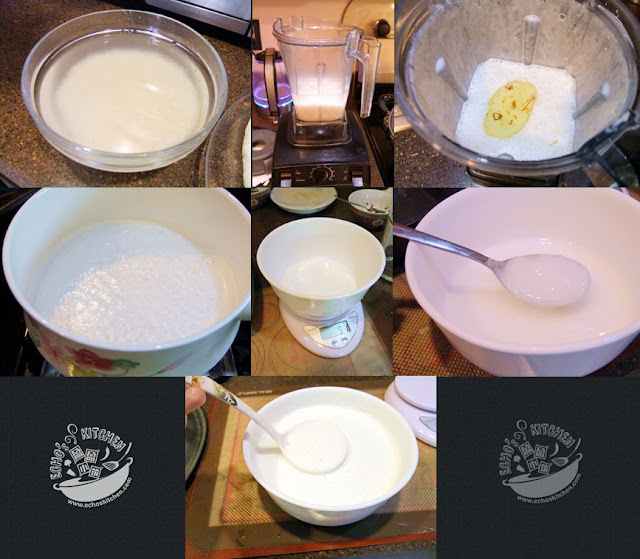 Hi, thanks for sharing your interesting CCF recipe that using 3 types of rice. Your CCF look really delicious, well done. Hi Amelia, welcome to my blog! I hope that you will like it! Hi Echo, I first came across your blog in an old Y3K magazine. I just want to thank you for posting so many yummy recipes on your blog. I have tried many of your recipes and I especially like the mutton curry. For someone who doesn't read Chinese, your effort in posting in both Chinese and English is very very much appreciated. Hey there! Welcome to my blog! I am glad that you liked some of my recipes! I will continue to post as I can. Do come back to pay me a visit again! 盈盈，好開心見到你在這裡，兒子很高大了吧，問好！🌹Thank you for the recipe, I will try to make it. 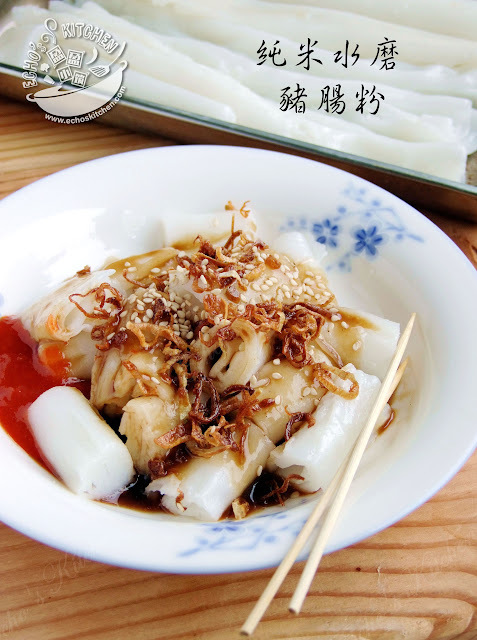 Hi!盈盈，好開心在這裡見到你，問好，兒子很高了吧？thank you for the recipe, I will try to make it.